Easter and spring tablescapes should be easy! This aqua and green coastal tablescape uses glass bottles, jute chargers and other easy everyday pieces for a simple, put-together look. Ever since we built this dining table, I’m having so much fun putting together different centerpiece and tablescapes. Today’s post is part of the week-long spring tablescape hosted by my friend Tammy from Pink Peppermint Design. You can see all sorts of beautiful spring table ideas linked at the end of this post – they’re making me want to just keep decorating and re-decorating our table! If you’re new around here, yay, welcome! A little background: This is the dining room in our rental house, which means the floor and light fixture aren’t my favorite. 🙂 We painted the walls (Agreeable Gray), built the farmhouse dining table (seriously if we can do it, so can you! ), added a rug and are slowly making over the rest of the room. You can see the dining room makeover plans here. We’re almost done – just have to finish building the benches for the table! I’d been eyeing these jute chargers and finally bought them. I looooove them. They’re just perfect for this aqua and green coastal tablescape! I have a thing for flamingos, I just think they’re so fun. So these pink and gold napkins are pretty perfect! Paper napkins are an easy, cheap way to dress up the table. To mix it up, I used a window valance (made from a shower curtain!) as a table runner. It’s the perfect size! If you want a similar look, I shared my favorite affordable white and green fabrics here. I put a few glass bottles on a wood cutting board and instant centerpiece! Those flowers are actually faux. But if you put water in the vases, everyone just thinks they’re real. The clear ones are available here, and the aqua bottles are from Target’s Dollar Spot, Marshall’s (they usually have good cheap ones!) and … the recycling bin, haha. Wine bottles are fun and free. And colorful straws are always an easy touch. I like mixing it up on top of the wine fridge, too. I’m loving the aqua and green coastal tablescape look – it could totally work into summer, too! Are you hosting any spring or Easter get togethers? Or just dressing up the table a bit for an everyday meal? Because I’m totally on board with that! Remember to hop around and see all of the other blogger’s gorgeous spring tables! Red Cottage Chronicles is next up on today’s tour. If you want even more tablescape ideas, you can see my other spring centerpiece idea (with the best ever faux eucalyptus) or all centerpiece ideas here. Meg your table is gorgeous!!!! What an awesome build, I love it! Also your blue glass bottles are SO pretty and the cutting board is a clever idea along with them for the centerpiece! Thanks so much, Lisa! I love the glass bottles, especially for pops of color for spring! Meg, your spring table is so lovely. The watery blues and greens are so soft and soothing. I’m so happy to be touring with you again! Meg I love your beautiful spring table! I like your color choices; the green with aqua is so fresh and inviting. So pretty! Thanks, Joan! I’m loving aqua and green together lately! 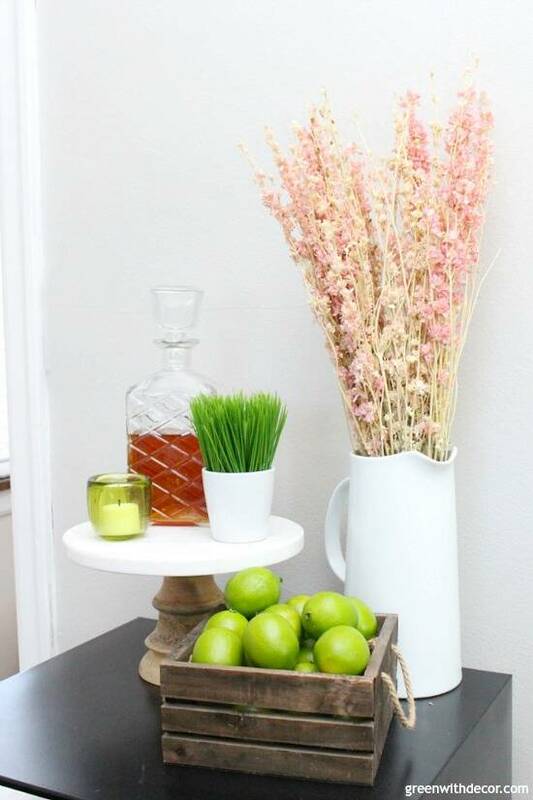 Your Spring table is so pretty and I just love the aqua bottles, they really add such a beach vibe to it all! Lovely! What a beautiful and fresh table. I love the faux flowers. They look like allium, and the bottles are gorgeous. Something else I pick up at antique/thrift shops. I’m so glad to see that colored glass is making a comeback. Original or reproductions, doesn’t matter to me. They are just pretty. Of course you have lots of your signature green. Perfect for spring! Thanks, Patti! Glass bottles are just the best, aren’t they? !